Ethan Pritcher, Body Switcher, is the latest fun, fast-paced juvenile adventure from author Douglas E. Richards, whose adult thriller, WIRED, was a breakout New York Times and USA Today bestseller in 2011. And while a sequel to WIRED is in the works, Richards continues to enjoy writing for children. His articles for National Geographic KIDS magazine have been translated into a dozen languages, and in 2010, in honor of his acclaimed juvenile science fiction series, The Prometheus Project, he was invited to be a Special Guest at San Diego Comic-Con International, along with such icons as Stan Lee, Rick Riordan, and Ray Bradbury. In Body Switcher, Ethan Pritcher is a normal kid who periodically switches bodies with someone else. He doesn't know how or why, he just knows that it happens—and always when he least expects it. After trading identities with a muscle-bound movie star, Ethan finds himself in a big trouble. When he learns that a hired killer is after him, just staying alive will be a big challenge. But his sister, Madison, may have the toughest job of all. She'll have to find a way to keep the movie star, now inhabiting Ethan's body, from getting her brother kicked out of sixth grade. . . 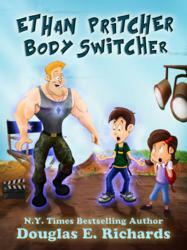 Body Switcher, for ages eight and up, may well be the start of a series—but that's up to the kids. At the end of the book, kids are told that they have the power to determine if this will become a series. If they want more, they can vote at WriteMoreSwitcherBooks(at)gmail(dot)com. They are also asked to recommend who Ethan should switch with next, either choosing from a list or coming up with their own ideas. "Assuming the kids want more books," says Richards, "I think it will be great fun for them to be able to influence the plots of upcoming editions. And while my adult writing career is taking off," he adds, "I'm happy to keep writing Switcher books for as long as kids continue to enjoy them."